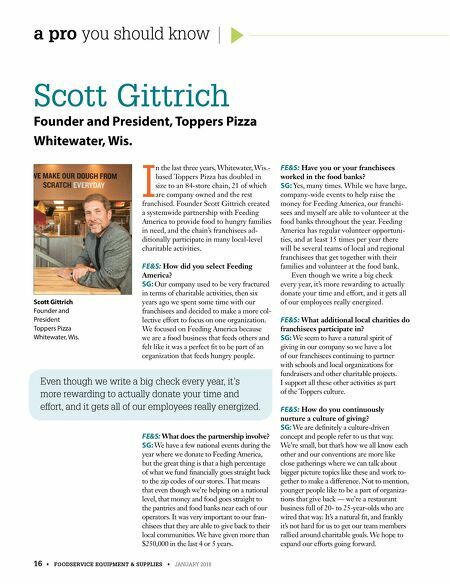 16 • FOODSERVICE EQUIPMENT & SUPPLIES • JANUARY 2018 a pro you should know Scott Gittrich Founder and President, Toppers Pizza Whitewater, Wis. I n the last three years, Whitewater, Wis.- based Toppers Pizza has doubled in size to an 84-store chain, 21 of which are company owned and the rest franchised. Founder Scott Gittrich created a systemwide partnership with Feeding America to provide food to hungry families in need, and the chain's franchisees ad- ditionally participate in many local-level charitable activities. FE&S: How did you select Feeding America? 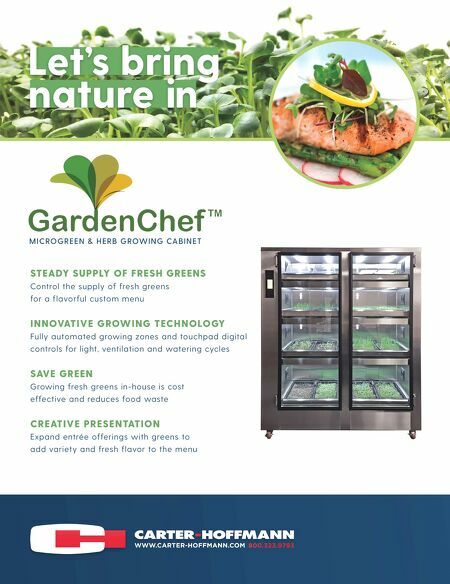 SG: Our company used to be very fractured in terms of charitable activities, then six years ago we spent some time with our franchisees and decided to make a more col- lective effort to focus on one organization. We focused on Feeding America because we are a food business that feeds others and felt like it was a perfect fit to be part of an organization that feeds hungry people. FE&S: What does the partnership involve? SG: We have a few national events during the year where we donate to Feeding America, but the great thing is that a high percentage of what we fund financially goes straight back to the zip codes of our stores. That means that even though we're helping on a national level, that money and food goes straight to the pantries and food banks near each of our operators. It was very important to our fran- chisees that they are able to give back to their local communities. We have given more than $250,000 in the last 4 or 5 years. FE&S: Have you or your franchisees worked in the food banks? SG: Yes, many times. While we have large, company-wide events to help raise the money for Feeding America, our franchi- sees and myself are able to volunteer at the food banks throughout the year. Feeding America has regular volunteer opportuni- ties, and at least 15 times per year there will be several teams of local and regional franchisees that get together with their families and volunteer at the food bank. Even though we write a big check every year, it's more rewarding to actually donate your time and effort, and it gets all of our employees really energized. FE&S: What additional local charities do franchisees participate in? SG: We seem to have a natural spirit of giving in our company so we have a lot of our franchisees continuing to partner with schools and local organizations for fundraisers and other charitable projects. I support all these other activities as part of the Toppers culture. FE&S: How do you continuously nurture a culture of giving? SG: We are definitely a culture-driven concept and people refer to us that way. We're small, but that's how we all know each other and our conventions are more like close gatherings where we can talk about bigger picture topics like these and work to- gether to make a difference. Not to mention, younger people like to be a part of organiza- tions that give back — we're a restaurant business full of 20- to 25-year-olds who are wired that way. It's a natural fit, and frankly it's not hard for us to get our team members rallied around charitable goals. We hope to expand our efforts going forward. Even though we write a big check every year, it's more rewarding to actually donate your time and effort, and it gets all of our employees really energized. Scott Gittrich Founder and President Toppers Pizza Whitewater, Wis.